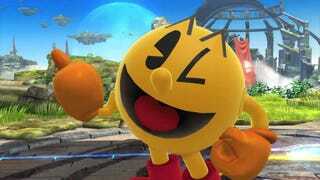 Pac-Man, one of the cheeriest-looking characters ever known in video games, has unlocked what looks like one of the biggest trolls moves in Smash Bros. thanks to a recently discovered glitch. Nicknamed the “trampoline stage drop” by the influential Smash forum Smashboards, the glitch makes the Pac’s opponent fall through through the floor of a stage. It’s like that secret trap door on the floor Mr. Burns triggers in The Simpsons every time he has someone in his office he doesn’t like (which happens a lot in The Simpsons). To trigger his newfound trap-door-activating ability, Pac-Man has to do is use one of his special moves (up-b), which creates a trampoline (though it really just looks like a small colored line that bounces around rubber-band style when jumped on) that Pac-Man can normally us to leap higher into the air. If an opponent steps on the trampoline, then, Pac-Man can create another one under his own feet, causing the original trampoline to disappear immediately. The glitch part of the equation is what happens next: after the trampoline disappears, the character standing on it will fall down as if the earth has been pulled out from under them. So it really is like a trap door. While the trampoline door will undoubtedly be a hilarious technique to use to surprise your friends during a game, it’s hard to see a glitch this powerful being approved for use in Smash Bros. tournaments going forward. I guess occasional moments of instability like this are just the price we have to pay for Nintendo finally updating and adding to their current-gen Smash Bros. game at semi-regular intervals.